Kaisilver claddagh rings are widely known to be the world's finest rendition of the 4 century old legend. We craft fine gold and silver claddagh rings with the gemstone of your choice for ladies and men. This special offer is applicable for the 14k gold claddagh ring with a gem from the first category of gemstones mentioned in the price table. You can order your 14k claddagh ring in white, yellow or rose gold and the price remains the same for all three gold colors. This ring is today respected as the most meaningful jewel in history. The claddagh ring had a very humble beginning and was first crafted by an Irish fisherman turned slave. The young man named Robert Joyce defined the features of the jewel with the hope that, they would express his true feelings for his beloved. The heart symbolized love, the hands showed togetherness and the crown signified his loyalty. The qualities of love, togetherness and loyalty are absolutely essential for any relationship to progress and grow. Years later Robert was released from slavery and went back to his small village, he rushed to meet his beloved and was extremely happy to see that she was still waiting for him. The two young hearts embraced each other and he gave her the ring, they were soon married and lived happily ever after. As word of the jewel and its touching story spread, people across the world realized that the love, togetherness and loyalty symbolism of the claddagh ring was not limited to matrimonial relationship. The Kaisilver claddagh ring is today proudly worn by more than 2,000 gem and jewelry lovers spread across 8 nations. You can order your claddagh ring in all ring sizes, there is a choice of 14k and 18k gold and sterling silver. We do not place any restriction on the choice of gemstones for this ring or any other jewel that we custom make. However this special offer applies only to 14k white, yellow or rose gold claddagh rings with gems selected from the first category listed in the price table. The gemstones will have a size of 7.5mm to 8mm, and the 14k ring will weigh around 8 to 10 grams. The claddagh ring is suitable for all occasions, you could buy it for yourself or as a meaningful gift for a special girl or lady in your life. Mothers Day, Valentine's Day, an engagement or wedding, a gift for a loving wife or a token of appreciation to someone important to you. 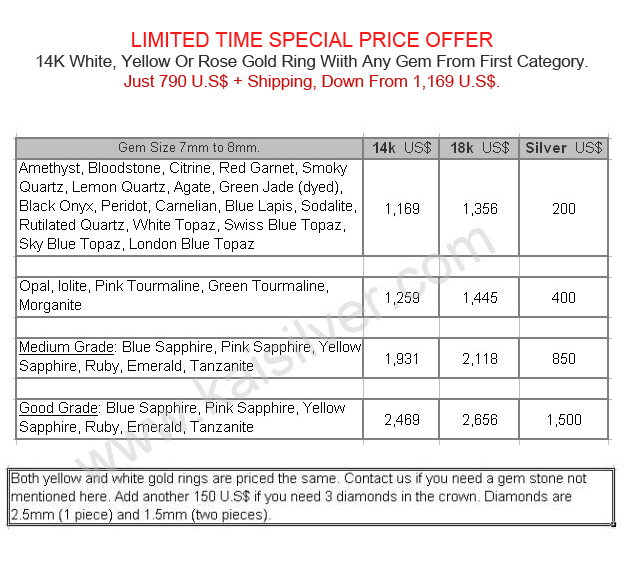 Among the gems in the first category mentioned in the price list, you have a choice of 4 birthstones. This special offer for the 14k claddagh ring includes garnet the January birthstone, amethyst the february birthstone and citrine the November birthstone and the green beauty peridot which happens to be the birthstone for the month of August. Highlights Of The 14k Claddagh Ring Special Offer. 14k white, yellow or rose gold. Weight approximately 8 to 10 grams. You can pick any of the gems from the first category of the price table. The gemstone will be 7.5mm to 8mm heart shape. Good craftsmanship and custom cut gemstones. The ring retains all features of the first ring made around 4 centuries ago. The options for diamonds in the crown has an additional charge. The ring can be ordered in all sizes from 5 to 10, including all half and quarter sizes. The design incorporates a very secure mounting and protection for the gemstone. You can request for a name or short message to be etched inside the band. The ring is suitable for all occasions both casual and formal, read the above content for ideas. Kaisilver: We are one of the leading online providers for high end custom made jewelry. We custom make quality jewelry in gold or 925 silver with gems and designs of your choice. The claddagh ring in gold and sterling silver is just one of the many Kaisilver jewels that are proudly worn by quality conscious jewelry buyers across the world. We welcome your own designs to be custom made, contact our support experts at sales@kaisilver.com with any queries or requests that you might have. We provide the same quality of workmanship and gems for silver and gold jewelry. How To Buy: We encourage you to discuss all your requirements with our experts at sales@kaisilver.com this will help you make a well informed buying decision. Production is 4 to 6 weeks from the date of order confirmation and receipt of payment. Paypal and Western Union are the modes of payment that we prefer but, we would recommend Paypal for first time buyers. Let us know your choice of payment and we will provide details and instructions for the same. Your parcel will ship through FEDEX and can be tracked on the web. There is an additional charge to be added to the above prices to cover the cost of shipping. Add 35 U.S$ for shipping to the U.S, Australia, New Zealand and Japan. The cost of FEDEX shipping to most parts of Europe is 45 U.S$. You will be informed of the exact shipping charges once we have details of your location.